Barossa Fest originated from a cross between Golden Dwarf Champion and Green Giant in 2005 made by Patrina Nuske Small named Sneezy F1. Barossa Fest is a mid-season indeterminate potato leaf dwarf and is among the tallest of its type reaching around 4 1/2 feet by end of season. 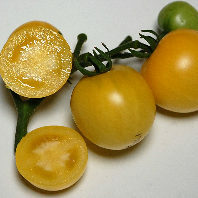 It produces abundant small pale yellow globes that have a sweet and tangy combination of flavours, bright and fresh on the palate and delicious. This variety was selected and named by Patrina.The Barossa Valley is one of South Australia’s premier wine-growing regions where vintage festivals are celebrated each harvest season.